Created in 2016, Thrive Economic Development (ThriveED), is a 501c3 non-profit organization supported by a coalition of area business and community and civic leaders. 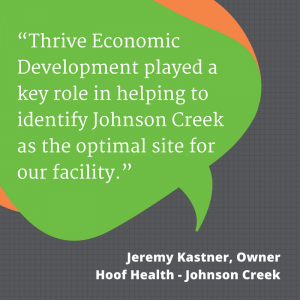 ThriveED is dedicated to working toward prosperity in Jefferson and Dodge counties. Our Vision and Mission Statements bear this out. Our Vision Statement is: ThriveED will lead change necessary to support economic growth in Jefferson & Dodge counties that result in healthy, thriving and growing communities. Our Mission Statement is: ThriveED will engage the public and private sectors in actions focused on attracting and supporting business growth that benefits the residents and communities of Jefferson and Dodge counties. These will serve as guides for the work of our organization, answering the why, who and what questions that give meaning and purpose to the work in our Strategic Plan. Read our Strategic Plan. Our business-focused services include connecting businesses to financial resources and incentives and helping to remove barriers to businesses looking to invest in our two-county region. 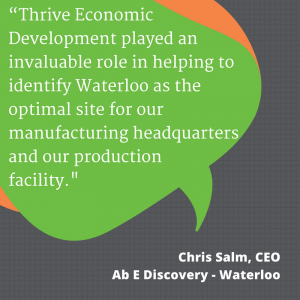 The Thrive Economic Development team is the go-to professional resource for businesses, site selectors and developers. 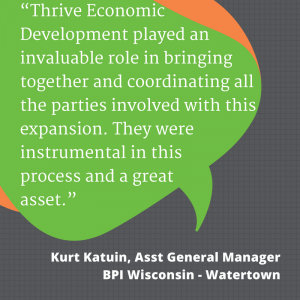 Thrive Economic Development (ThriveED) is very fortunate to have strong partnerships with private sector businesses, county and municipal entities, educational institutions and other community and economic development organizations. Meet them below. ThriveED's professional staff and dedicated Board of Directors work together to help promote economic vitality in Jefferson & Dodge counties. Let us put our strong partnerships to work for you. ThriveED partners with educational institutions, Chambers of Commerce and other organizations to help Jefferson & Dodge counties thrive.